Online vision tests are fairly simple. You view the tests on your computer and use your smartphone to indicate your answers. You'll be asked to stand or sit a certain distance away from the screen and will indicate how clearly you can see letters and shapes. After you take the test, an eye doctor reviews your results and sends you a prescription. What's the Problem with Online Vision Tests? Online vision sites offer convenience and may save you a little money -- at least initially. Unfortunately, if your prescription isn't correct, you may spend more than you anticipated when you combine the costs for the online test and a visit to your optometrist. Vision tests are conducted in a precisely controlled environment in your optometrist's office. Every patient views charts and screens at the same distance under the same lighting conditions. If you take an online test, you probably won't pull out a tape measure to make sure that you stand the required distance from the screen. Standing a little too far or a little too close may affect your results, as can taking the test in a room that's too bright or too dark. Comfort is a very important factor if you wear contact lenses. In addition to noting the correction needed for each eye, your prescription also includes the base curve for your new lenses. The most comfortable lenses feature curves that closely conform to the natural curvature of your cornea. Online tests can't measure your curve and must rely on information from your previous prescription. Unfortunately, all manufacturers don't use the same standard when determining base curves. If you switch brands, your previous base curve may not be the best choice for your new lenses. Examinations in your optometrist's office include tests that measure your iris, pupils and the curvature of your eye and provide information about the surface of your cornea. These tests help ensure that your contacts fit well and provide excellent vision. 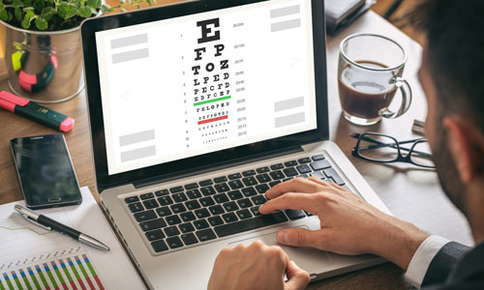 Online vision tests may not accurately detect astigmatism, a refractive error that occurs due to an irregularity in the curvature of your cornea. During an in-office visit, your eye doctor uses several machines to check the extent of your astigmatism and determine the best prescription for you. Without information from these tests, it can be difficult to accurately measure astigmatism. If your new lenses don't correct your astigmatism, you may notice that everything looks a little blurry. You might also experience eyestrain or headaches. What Advantages Do In-Office Visits Offer? Online vision tests generally only cover visual acuity testing, which measures your ability to see clearly. An acuity test is an important part of your visit to the optometrist, but it's not the only test or examination performed during your visit. Your eye doctor will also thoroughly examine your eyes and look for signs that you may indicate that you have an eye condition or disease. Some vision problems, like glaucoma, might not cause symptoms until your eyes have already been damaged. During your visit to the eye doctor, you'll receive a glaucoma test that measures the pressure inside your eye. If your pressure is too high, your optometrist can recommend treatments that will help you avoid loss of vision. Dilating your eyes allows your eye doctor to view the retina, the thin layer of light-sensing cells at the back of your eye. When your eyes are dilated, it's much easier to detect signs of macular degeneration, optic nerve irregularities, diabetic retinopathy, glaucoma, high blood pressure and other conditions and diseases that can cause visual impairments. During your visit, you'll also have the opportunity to share concerns or ask questions you may have about your eyes. For example, your eye doctor can recommend ointments or drops that will relieve dry eye, help you decide if bifocals or progressive lenses are best for you, or discuss management of chronic eye conditions or diseases. Is it time for your next eye exam? Call us to schedule your appointment.